Heavy ion collisions taking place at LHC and RHIC are designed to recreate in laboratory the Quark Gluon Plasma, the state of matter that existed microseconds after the Big Bang. The theory capability to appropriately define and calculate processes taking place inside a hot medium, like the jet quenching behavior, the thermal production and interaction properties of particles, the particle transport properties (conductivity, viscosity) greatly affects our understanding of this new state of matter and the behavior of nuclear matter for nonstandard values of temperature and pressure. This in turn has a large impact on cosmology. Two of the most important open problems in particle physics and cosmology, namely the nature and origin of the dark matter and the origin of the baryon asymmetry are affected by our capability to appropriately control the production rate of particles (like for example right-handed neutrinos or SUSY particles) from the thermal plasma. 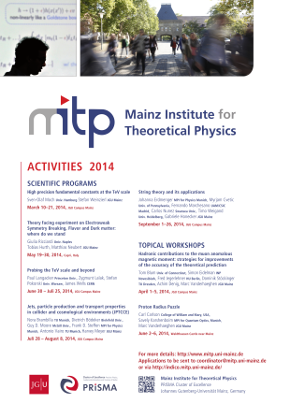 This program will aim at discussing the current open problems in this landscape putting together experts from the heavy ion and the cosmology/astroparticle community and making use of the latest developments in effective field theories and resummation methods at finite temperatures, lattice and other nonperturbative methods.